Every so often, a hotel comes along that ticks all of my boxes. 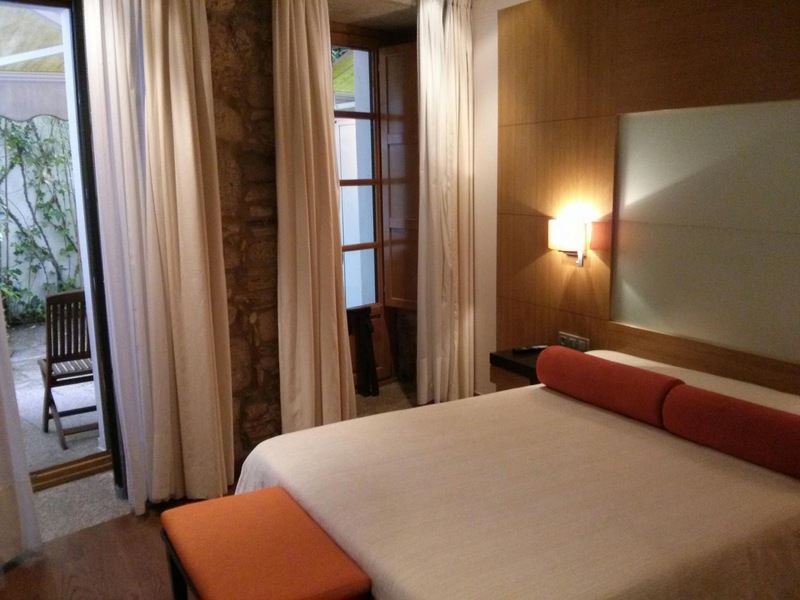 Lucky for me, I stayed in one last week - the Hotel Altair in Santiago de Compostela. Exposed brickwork and stylish rooms? Check. Right in the heart of the action, but on a quiet street? Check. Small, but not so tiny that you have to walk through the owner's living room to get to bed? Check. I wasn't sure what to expect when I headed to Santiago. I purposely didn't research it too much, so I would be surprised. I knew, of course, that it was the final destination for pilgrims walking the Camino, and that it had a grand cathedral. I'd been told that it was pretty, quaint and small. When I got there and took a walk around, I liked it instantly. The streets are cobbled, small and winding. The restaurants and squares are filled with locals, rather than tourists, and the food is out of this world. Just on the edge of the old town, the Altair has the advantage of a pretty backdrop, but without the hustle and bustle of any of the main squares. The cathedral is about 5-10 minutes away, and there are fantastic restaurants and bars just around the corner. We found a goth bar which tickled me no end, where we were served complimentary tapas as a middle aged man moshed alone to some death metal. There are only a few rooms in the hotel, all of which have high ceilings, huge windows and lush furnishings. I was lucky enough to have a room that led out to a private section of courtyard, which would have been divine had the sun made an appearance. The bathroom was huge with an amazing shower that had the kind of water pressure I can only dream about. I was the nearest room to the reception area, which meant that I did have a bit of noise if there was a crowd outside. It also meant that the head of my bed backed on to the TV wall of my neighbours room, so there was a bit of residual football noise seeping in. Each morning, breakfast was served to the tables, continental style. You could choose from cereals, fruits, yoghurts etc, and then some more Galician fare such as cured hams, tomatoes and cheese. The orange juice was freshly squeezed and the cafe con leche was fantastic. Personally, I prefer a buffet for breakfast, as I can draw a blank on what I want unless I can see it. But that's just me. The women working here were all lovely, sweet and helpful. There was always someone around to help with directions, and they know the area well. Double rooms start at €95 in the low season, reaching €120 in the high season. For the style, quality and service, this seems fantastic value to me, though bear in mind breakfast isn't included, and costs €8.50pp.